Click below for some short videos of Birka's most recent midsummer party! In modern Sweden, Midsummer's Eve and Midsummer's Day (Midsommarafton and Midsommardagen) were formerly celebrated on 23 June and 24 June, but since 1953 the celebration has been moved to the Friday and Saturday between 19 June and 26 June. It is one of the most important holidays of the year in Sweden, and probably the most uniquely Swedish in the way it is celebrated. The main celebrations take place on the Friday, and the traditional events include raising and dancing around a huge maypole. Before the maypole is raised, greens and flowers are collected and used to cover the entire pole. 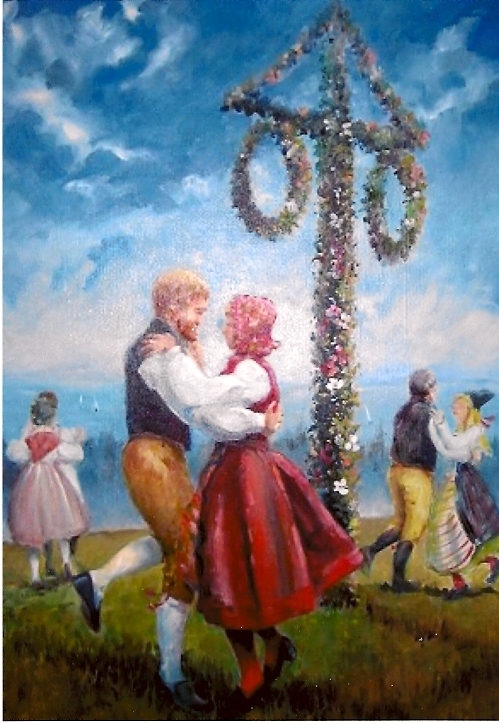 Raising and dancing around a maypole (majstång or midsommarstång) is an activity that attracts families and many others. People dancing around the pole listen to traditional music and some even wear traditional folk costumes. In addition, many wear crowns made of wild springs and wildflowers on their heads. The year's first potatoes, Soused herring, Chives, Sour Cream, Beer, Snaps and the first strawberries of the season are on the menu. Drinking songsSnapsvisor are also important at this feast, and many drink heavily. When Sweden got its National day (6 June), discussions were held about making Midsummer the Swedish national day because of the strong civil celebration on this day. Because Midsummer was thought to be one of the times of the year when magic was strongest, it was considered a good night to perform rituals to look into the future. Traditionally, young people pick bouquets of seven or nine different flowers and put them under their pillow in the hope of dreaming about their future spouse. In the past it was believed that herbs picked at Midsummer were highly potent, and water from springs could bring good health. Greenery placed over houses and barns were supposed to bring good fortune and health to people and livestock; this old tradition of decorating with greens continues, even though most don't take it seriously. To decorate with greens was called att maja (to may) and may be the origin of the word majstång, maja coming originally from the month May. Other researchers say the term came from German merchants who raised the maypole in June because the Swedish climate made it impossible to find the necessary greens and flowers in May, and continued to call it a maypole. Today, however, it is most commonly called a "midsommarstång" (literally midsummer's pole). n earlier times, small spires wrapped in greens were erected; this probably predates the maypole tradition, which is believed by many to have come from the continent in the Middle Ages. Others argue that some form of Midsummer pole occurred in Sweden during the pre-Christian times, and was a phallic fertility symbol, meant to impregnate the earth, but as there were no records from those times it cannot be proven, and this idea might just be a modern interpretation of the pole's form. The earliest historical mention of the maypole in Sweden is from the Middle Ages. Midsummer was, however, linked to an ancient fertility festival which was adapted into St. John's Day by the church, even though it retained many pagan traditions, as the Swedes were slow to give up the old heathen customs. The connection to fertility is naturally linked to the time of year. Many young people became passionate at Midsummer, and this was accepted, probably because it resulted in more childbirths in March which was a good time for children to be born. In Denmark and Norway midsummer is referred to as the eve of Skt. Hans but it's only in Sweden that it has kept its original name. In Sweden and parts of Finland, the tradition of bonfires is not part of Midsummer but rather of the "Valborg's" evening festivities, when winter leaves are burned for summer. An old Swedish tradition is that unmarried girls should before bedtime midsummer´s eve pick seven kinds of flowers and jump over seven roundpole fences and then sleep with the flowers under the pillow. During the night they will dream about the boys they will get married to. Midsummer celebrations are held throughout the US. The NYC Swedish Midsummer celebrations in Battery Park, New York City, attracts some 3,000-5,000 people annually, which makes it one of the largest celebrations after the ones held in Leksand and at the Skansen Park in Stockholm. Sweden Day, a Midsummer celebration which also honors Swedish heritage and history which has been held annually on the sound in Throgs Neck, in New York City since 1941. Swedish Midsummer is also celebrated in other places with large Swedish and Scandinavian populations, such as Chicago,Minneapolis, and Lindsborg, Kansas. The Swedish "language village" (summer camp) Sjölunden, run by Concordia College in Minnesota, also celebrates Midsummer. Geneva, Illinois, hosts a Swedish Day (Swedish:Svenskarnas Dag) festival on the third Sunday of June. The event, featuring maypole-raising, dancing, and presentation of an authentic Viking ship, dates back to 1911. The Seattle, Washington neighborhood of Fremont puts on a large Summer Solstice Parade & Pageant, which for many years has controversially included painted naked cyclists. In St. Edwards Park in Kenmore, Washington, the Skandia Folkdance Society hosts Midsommarfest, which includes a Scandinavian solstice pole. A solstitial celebration is held on Casper Mountain in Wyoming at Crimson Dawn park. Crimson Dawn is known in the area for the great stories of mythical creatures and people that live on Casper Mountain. The celebration is attended by many people from the community, and from around the country. A large bonfire is held and all are invited to throw a handful of red dirt into the fire in hopes that they get their wish granted. In Michigan's Upper Peninsula, the large number of Finnish and other northern European descendents celebrate Juhannus annually by holding a beachfront bonfire on the Saturday following the first day of summer.